What: The focus of NOAA's field experiment includes ESRL CSD airborne measurements using the NOAA WP-3D aircraft. This experiment will be coordinated with the POLARCAT activity of the IPY, with the NOAA baseline climate research station at Barrow, Alaska, and with the intensive operations period executed at the DOE-sponsored Atmospheric Radiation Measurement site adjacent to NOAA's Barrow site. Who: Investigators in this project include researchers from several universities, industries, and governmental agencies. Participating institutions include Georgia Tech, the University of Colorado at Boulder, and NASA Ames Research Center. 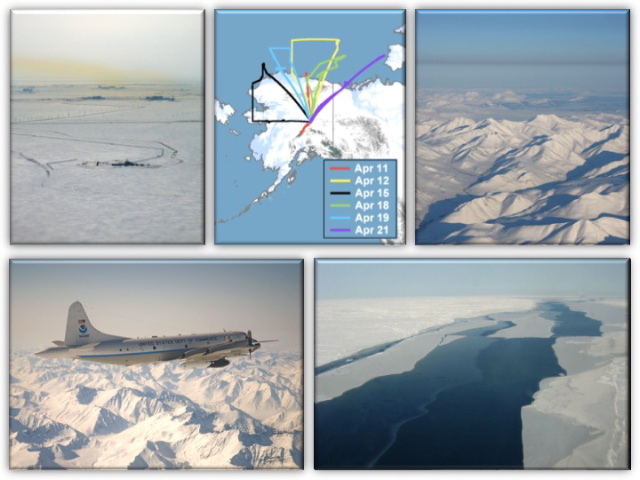 photo collage: Julie Cozic, NOAA ESRL CSD. clockwise: Prudoe Bay plume. Photo: Sara Lance, NOAA ESRL CSD. ; Project flight tracks over Alaska. Image: Ken Aikin, NOAA ESRL CSD. ; Arctic haze layer (April 12, 2008). Photo: Daniel Lack, NOAA ESRL CSD. ; Arctic Ocean leads partially refrozen. Photo: John Nowak, NOAA ESRL CSD; NOAA WP-3D Orion aircraft over the Brooks Range in Alaska (April 12, 2008). Photo: Eric James, NASA ARC.